Attending a summer BBQ? We’ve got a super NOSHY twist to hummus that is both flavorful and festive!! 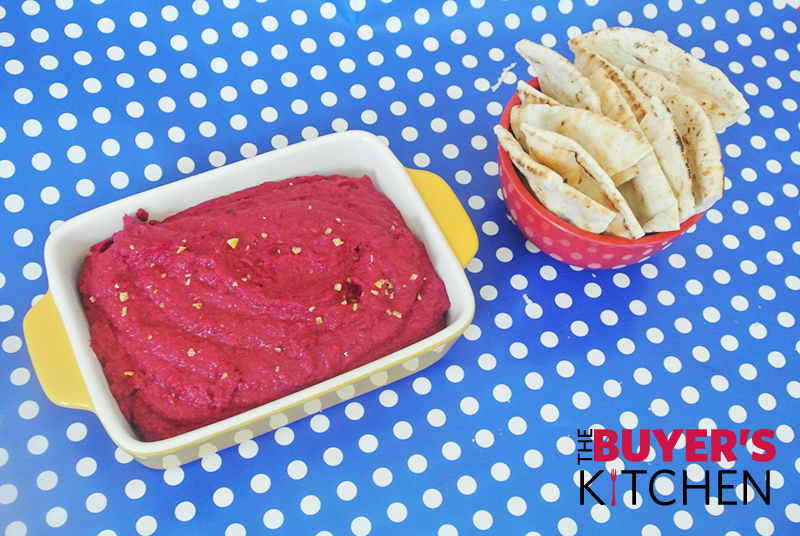 Roasted Beet Hummus! This colorful and tangy spread pairs perfectly with: chips, pita bread, and sliced vegetables. Roast the beets: Heat the oven to 400°F. Peel the beets then wrap them loosely in foil. Transfer the wrapped beets to a baking sheet. Roast for 50-60 minutes. Check the beets every 20 minutes or so. If they are starting to look dry or are scorching on the bottoms, dribble a tablespoon of water over the beets before re-wrapping. Beets are done when a fork or skewer slides easily to the middle of the beet. Small beets will cook more quickly than large beets. ** Beets can be stored whole or sliced for up to a week in the refrigerator. Allow to cool for about 10 minutes. Prep the Processor: Mince the garlic, zest the lemon. In a food processor (or blender) add the beets, garbanzo beans, tahini, garlic, lemon zest & juice, olive oil & season with salt and pepper. Puree until smooth and creamy with desired consistency. You may adjust the levels of garlic & lemon to your preference.